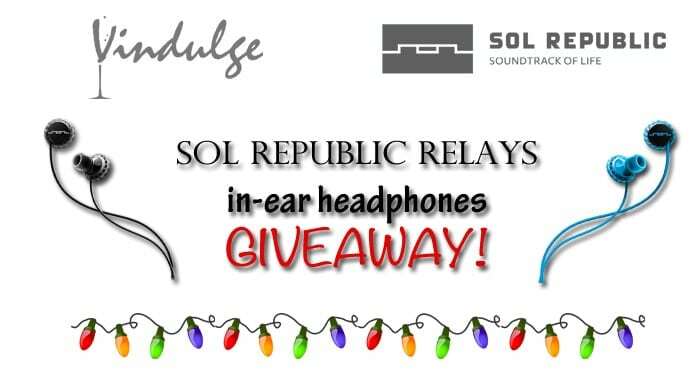 SOL REPUBLIC RELAYS in-ear Headphones Giveaway! How important are headphones when you’re traveling, exercising, on a conference call, or just trying to tune out your children? If your answer was even the slightest bit “important”, then we have an exciting giveaway for y’all today. A pair of SOL REPUBLIC RELAYS In-Ear 3-Button Headphones. Being a runner I can tell you that having comfortable ear buds are as important to having sturdy well-fitting shoes and a good sports bra (yeah I went there)! Nothing ruins a peaceful run more than ear buds that fall out every 30 seconds (I’m talking to YOU cheap white ear buds that come with every single Apple product! #worstearbudsever). Over the last few years I’ve gone through several of the big brands; Bose and Shure in-ear headphones were the two most recent. Both of which, I might add, were priced about the same (around $100) and both lasted less than a year (lame). So I was intrigued when SOL REPUBLIC offered to let me test out their RELAYS headphones and offered to give one away to a reader. Hooray for free prizes for loyal readers! If you’re looking for some new in-ear headphones for a last-minute Christmas gift, these are definitely ones to consider. I’ve been using them for over a month now. They have traveled to Italy and back, have gone on numerous runs with me, and have endured the abuse of two destructive four-year-olds, a husbands three city travel week from Portland to Toronto and several stops in between, and they’re still going strong! Now, I’ll be the first to admit, I’m not one of those people who rate headphones solely on how friggin’ loud they get and how powerful the base is. In reality, if you want a strong base and ultra powerful sound, you’re not going to get that in a tiny ear bud unless you want to pay more than $500. No thanks. The most important things I look for are, 1) comfort, 2) how well they stay in my ears, 3) price, and finally, 4) sound quality. 1) They have, have, have to be comfortable! When I’m traveling and trying to fall asleep I don’t want something poking into my ears causing pain (hey, Shure, you’re the worst with that!). The cool thing about these is they have a flat outside surface that doesn’t poke out, making them comfortable if you are laying against something (like a pillow). I wear a beanie when I run in the wintertime, and with my old headphones even the slightest pressure from the hat pushed the ear buds further into my ears, causing pain. These don’t have that problem at all. Super comfy. 2) They MUST stay in my ears on a run. Apple headphones are the absolute worst for that. These RELAYS rock for staying in my ear. In fact, I’ll go as far as saying they’ve been the best in-ear headphones I’ve ever experienced that stay comfortably in my ear throughout any lengthy run. I honestly don’t even feel them once they’re in. Even headbanging while listening to Guns N’ Roses doesn’t make these bad boys fall out of my ears. True story. I tested it out. They are comfy, and stay in my ears. Check. 3) They’re priced right for the quality and comfort level, at an average of $75, which is still cheaper than both the Bose and Shure I’ve been using. I just did some research and they’re actually on sale at RadioShack for $59.99 (compared to $95 at Amazon… how’s that for a bargain?!). 4) As far as sound goes, they’ve been great so far. But like I mentioned, I’m not rocking out to music so loud I can’t even hear my own thoughts, and I’m not one to bump up the base. I appreciate my good sense of hearing and I intend to keep it until I’m old. I like to listen to music at a reasonable volume, and for a reasonable volume these are great. Whether I’m rocking out to the Paul Oakenfold Pandora station, jammin’ to Taylor Swift (don’t judge), getting nostalgic with Elton John, having a dance party with Prince, or just relaxing to Enya… these are solid headphones with good sound quality! And guess what, just in time for the holidays I’m giving a pair away to one lucky reader! Contest is open to U.S. and Canada residents only. Anybody who contributes barbecue content to this site is ineligible to apply (a-hem, I’m talking to you, hubby). Contest ends at 12:00am Pacific time on Dec 23rd, so you’ll know by Christmas if you won the holiday giveaway. Wohoo! Winner will be notified by email. I want comfort, and AWESOME sound, a long cord and a volume remote! The Wine Harlot needs a pair — my old ones are lame and lost. Pick me, pick me, Santa! Good luck 🙂 I feel ya! I’ve been through way too many lame pairs of headphones! And my boys are notorious for “losing” everything. I keep these ones up high, away from their reach! I want good sound quality. comfort and style is always my big thing. Good sound quality and a reasonable price. I look for comfort! Some are so uncomfortable and don’t feel right on. A reasonable price point and something that is long lasting. Quality is the main thing I lok for.